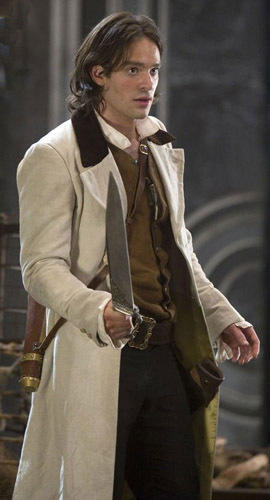 Tristan is the hero of Stardust, a Neil Gaiman novella that was made into a movie in 2007, and which sadly flew a bit under the radar. It's an utterly fantastic movie, and not nearly enough people have seen it. If you liked The Princess Bride (and is there anyone out there who doesn't? ), then you'll love Stardust. It's a fantasy movie for grownups (you can't say "adult" because that means something entirely different!) 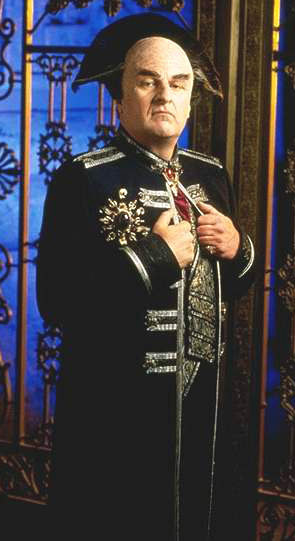 with humor and sarcasm and a smidge of ridiculousness, and also Robert De Niro as a cross-dressing sky pirate. How can you say no to that? Anyway, in the course of the movie, Tristan gets a snazzy new outfit (courtesy of the above-mentioned De Niro) with a long, cream-colored coat. We hadn't even left the theater when my husband said, "I WANT THAT COAT." 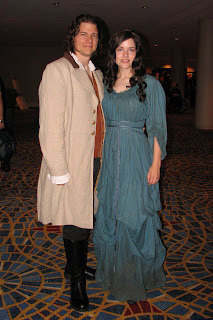 Since I'd been coveting the blue dress worn by Yvaine, the heroine, I was happy to oblige! This costume was debuted at Dragon*Con 2008. 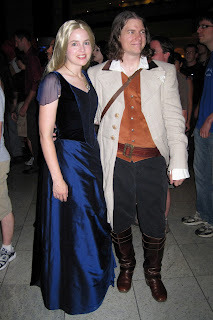 I hadn't yet finished my Yvaine costume, but my friend Kimmerie saved the day-- she'd won an auction for a screen-worn costume for the character of Una, which she very kindly allowed me to wear. I finished my Yvaine costume the following year. ...so anyway, if you're a fan of "How I Met Your Mother" (and if you're not, you should try it! ), you know that the character Robin Scherbatsky, a no-nonsense, career-oriented tomboy, has a deep dark secret-- that as a teenager, she toured malls all across Canada as "Robin Sparkles." When her friends discover the music video of "Let's Go to the Mall," she's utterly mortified, and everyone else is riotously entertained. The HIMYM folks actually made a full music video, and it is 80s-tastic; they've got it on YouTube here. I love HIMYM, and I laughed my head of at the LGTTM music video (honestly, the whole episode where Robin Sparkles is revealed, called "Slap Bet," is a classic). 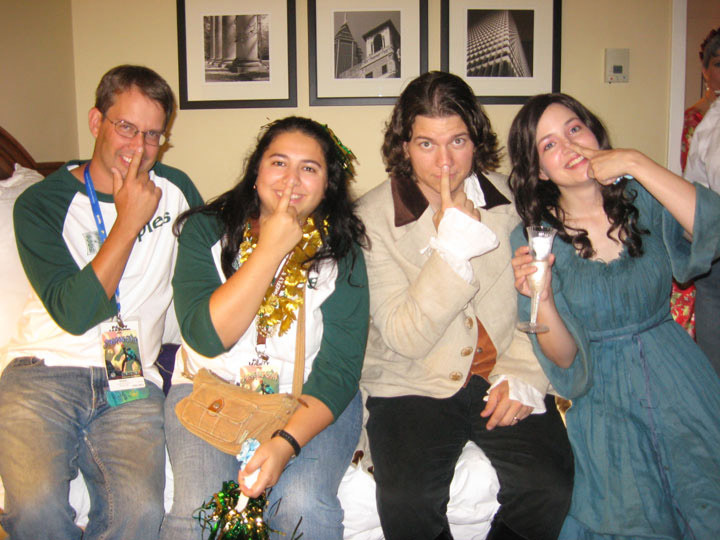 So after I went to Dragon*Con for the first time in 2007 and discovered people dressed up as all sorts of random TV characters (Jim and Pam in their Halloween costumes! Adam and Jamie from Mythbusters! 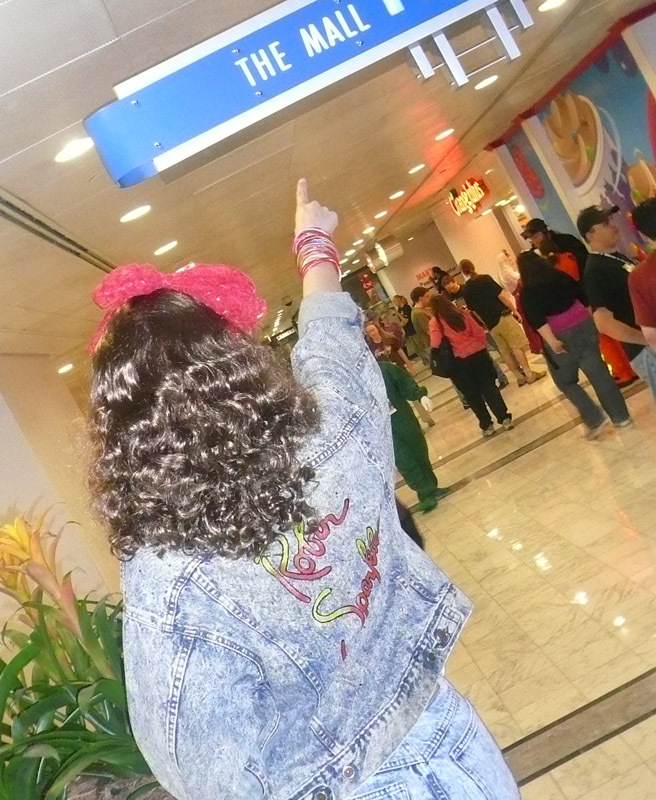 ), I decided it was the perfect place to run around as Robin Sparkles. 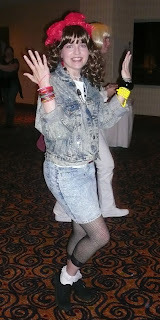 I debuted my costume at D*C 2008 on Friday night, and had so much fun that I wore it on Saturday as well. 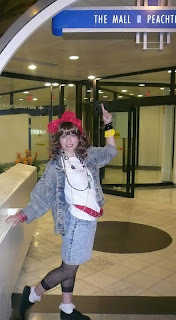 And a good thing too, because it turned out that there was another girl dressed as Robin Sparkles on Saturday. 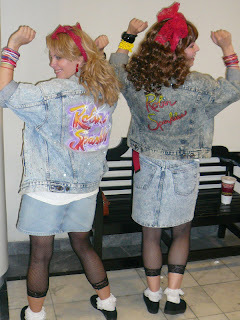 We met by chance-- and I am 100% not kidding-- AT THE MALL. 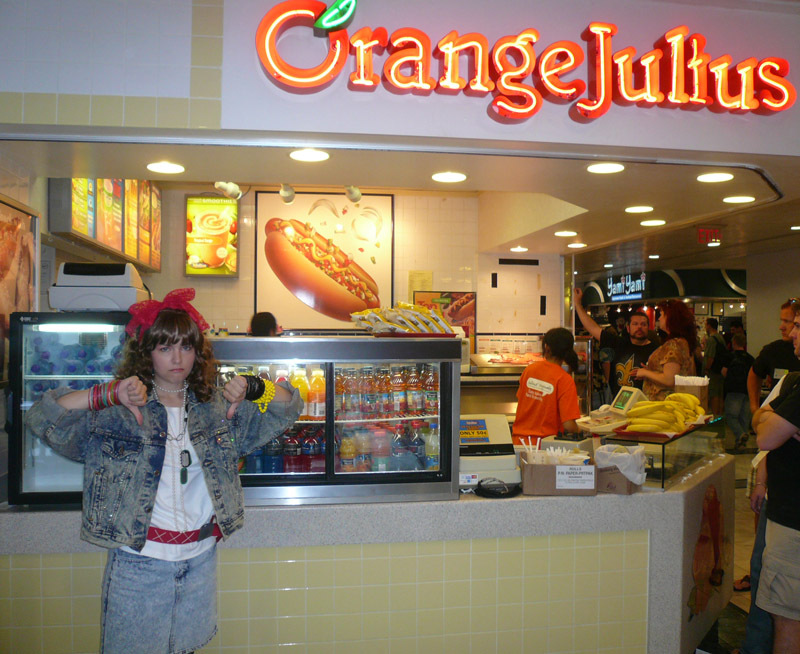 IN THE FOOD COURT. It was glorious. Actually, the reaction I got as Robin was fantastic. Not everyone recognized me, but the ones who did *freaked out. 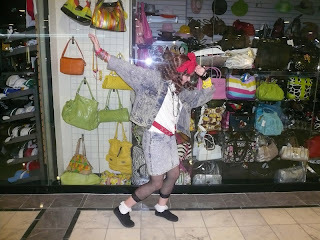 * It's a hella fun costume, and as the song says, "having fun is what it's all aboot." 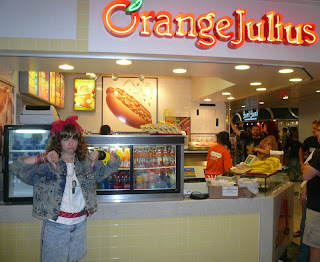 This was definitely not a costume I had ever planned to make, I'll tell you that! 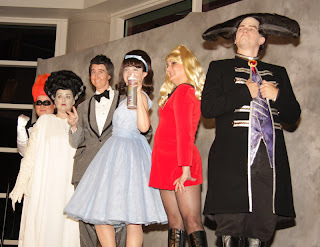 My friend Cordelia suggested a skit for the San Diego Comic-Con 2008 Masquerade that involved a bunch of sci-fi characters with big hair. My husband, who's a big Babylon 5 fan, said, "I want to be Londo! ", the Centauri ambassador with an impressive sideways mohawk. Video and pictures from the skit are available here. Anyway, I agreed to make the costume if he handled the wig. 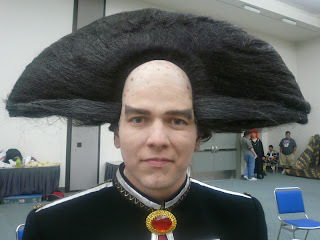 (He decided to make the wig bigger than it actually was on the show, to up the silliness factor of the skit.) Londo got a huge cheer from the audience when he first appeared! Still plenty of B5 fans out there. 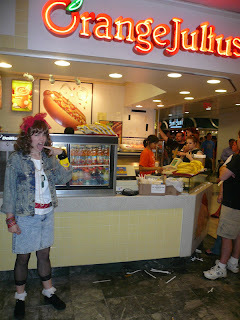 He's also worn the costume without the wig and people still recognized him, which I consider an unqualified success! I first saw the movie version of the musical Hairspray in spring 2008, and I absolutely fell in love-- the story, the songs, the costumes, everything was completely awesome. (I mean, giant production numbers. What's not to love?) I especially adored the last number in the show, "You Can't Stop the Beat," and the gorgeous dresses the dancers were wearing. Oh man, did I ever want one of those pretty pastel dresses with their big twirly skirts! 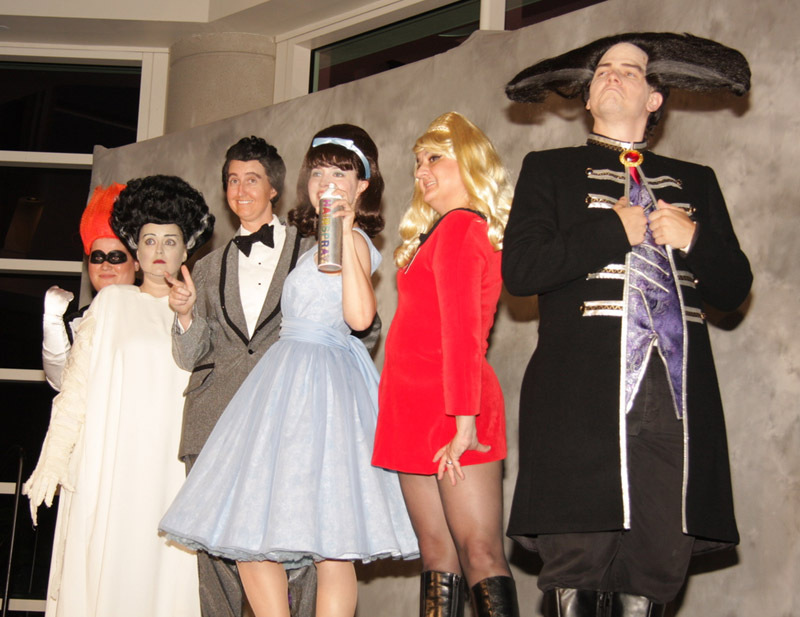 I got my chance when my friend Cordelia suggested a Hairspray-themed skit for the San Diego Comic-Con 2008 Masquerade. 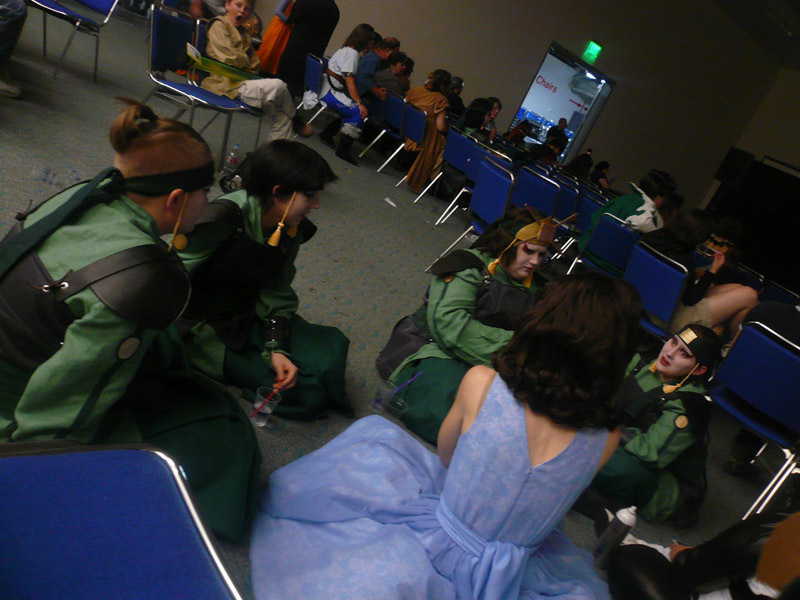 (A video of the skit, plus more pictures, are available on that page.) 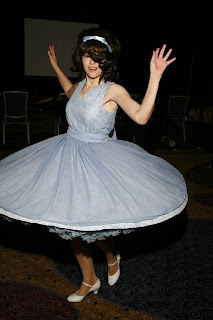 This has become my new favorite party dress-- I've worn it many times since I made it, including to the wedding of a fellow costumer and my work holiday party! 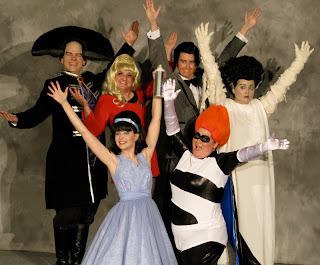 Fandoms: Hairspray, plus many others! My Space Girl was T'Posh-- a mashup of Posh Spice (better known these days as Victoria Beckham) and T'Pol, the Vulcan officer from Enterprise. 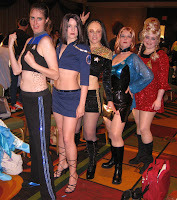 One of my favorite episodes of Enterprise (okay, also one of the only ones I've seen) is the mirror universe two-parter, where all the female crewmembers wear form-fitting, midriff-baring versions of the uniform jumpsuit. I'm not even kidding. *Midriff jumpsuits. * They're so fantastically over-the-top, I wanted to hug the costume designer when I saw the episode. T'Pol normally doesn't wear the Enterprise jumpsuit uniform, but she does in the mirror episodes. So I took that as my starting point, but I changed the pants to a skirt, because Posh usually wore skirts. Then I added five-inch heels with laces that wrapped up the leg, sort of like Posh's shoes in this picture, and a wig that looked like the Posh bob. And of course a pair of pointy ears! Oddly enough (or perhaps not so oddly), my husband provided the intial spark for this idea. 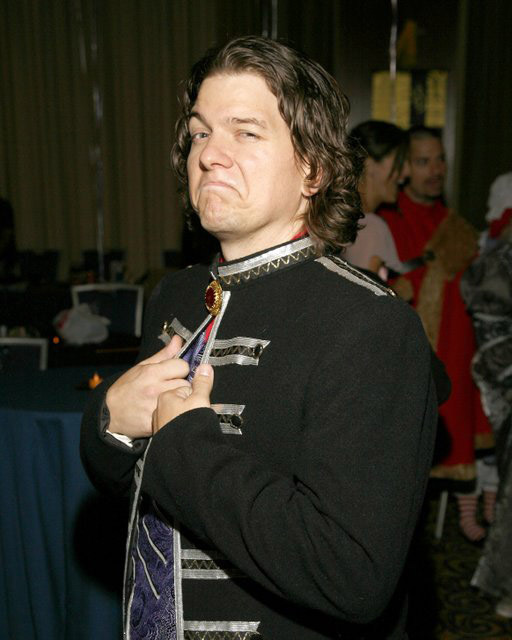 We were brainstorming Masquerade skits while driving home one night after Comic-Con 2007, and he suggested a Spice Girls parody, maybe with Battlestar Galactica characters. I mentioned this to my partner-in-masquerade-crime Cordelia, and she said, "Hey, what if we did it with Star Trek characters? There are five Star Trek series, and five Spice Girls, so we could do one from each series, and call it the Space Girls." She started reeling off which character should be which Spice, and we were sold. 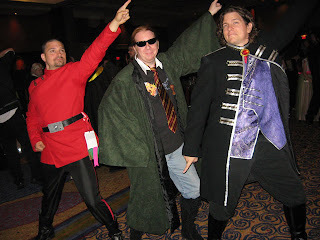 We decided to do the skit at the SciFi/Fantasy Masquerade at Costume-Con 26 in San Jose, which was in April 2008. We weren't really sure how it would be received, since Costume-Cons tend to focus more on construction; but a bunch of us were already planning on attending, so we decided we'd just go for it. 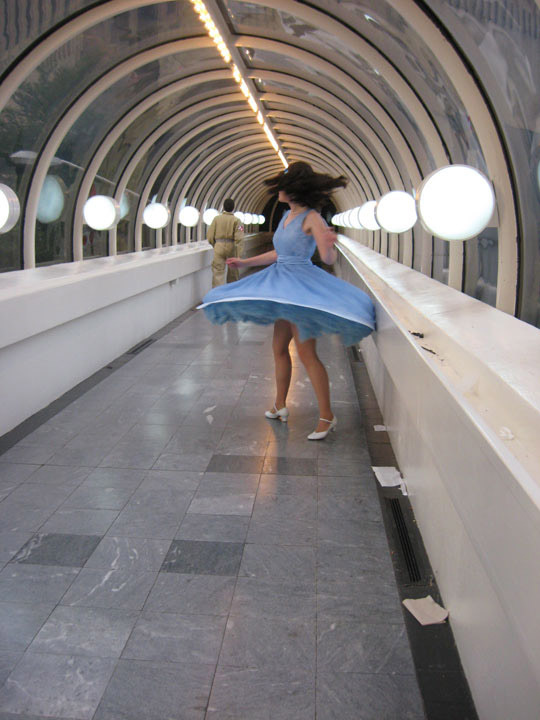 We each worked out how to meld our Star Trek character and Spice Girl into one costume, and Cordelia wrote a parody of "Wannabe" and choreographed a 90-second routine for us. We had *SO* much fun with this skit, I can't even begin to tell you. The second we got off the stage, we wanted to get right back up and do it again. We were shocked and completely thrilled to win Best In Show for Presentation! I really just like making costumes and performing in masquerades. Kind of a lot. I also like running. 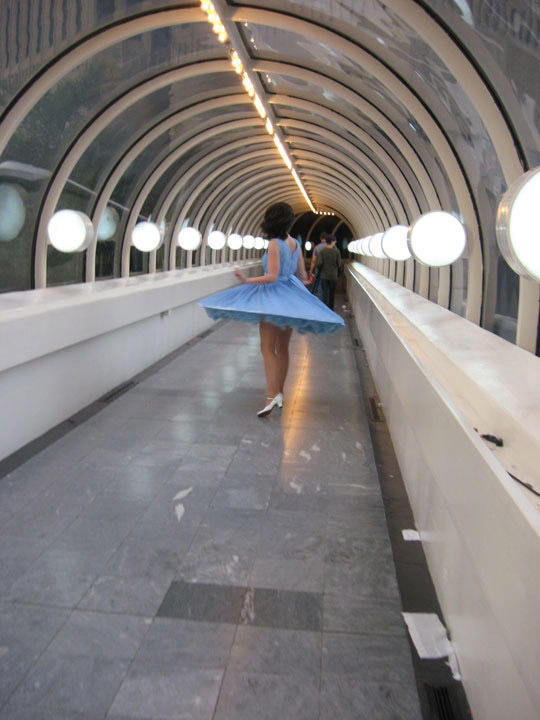 Sometimes I make costumes I can run in.